At Scaf, we can offer you a precise CNC router cutting service with our high quality CNC machine in Melbourne. We use the latest machine and technology, both in soft and hardware form, to deliver a fine and accurate cut every time. 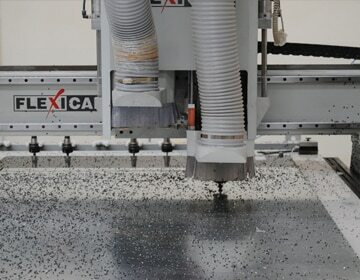 With a large table of 2 x 4 metres we are able to machine using any sheet size and almost any material. This also allows effective use of materials with minimum cut-offs. Using a vacuumed table we can ensure no movement from the material so that measurements are accurate and the cutting depth is correct and not varied as some materials can bend. With our large CNC machine in Melbourne, we are able to work with the largest sheets on the market with ease. You can rest assured that high quality is all you will receive. We also offer advanced Laser Cutting Services. We are always ready to assist you with your CNC cutting, fabrication and manufacturing projects using the latest techniques and equipment. Production runs of low or high volume are carried out with ‘attention to detail’ and your project files are stored on our database for simplified and convenient reordering. We are your go to team for your composite aluminium cutting, and any other materials you need.